Could the DRC Be Africa’s Next Third Term Battleground? After months of relative calm, the Democratic Republic of the Congo (DRC) has witnessed renewed anti-government protests, prompting the United Nations to warn that the country is again at risk of descending into political violence. The unrest has been prompted by uncertainty over the national electoral process. President Joseph Kabila will reach the end of his second term in 2016 and is constitutionally obligated to step down ahead of polls scheduled for November that year. But the former taxi driver, who was elevated to the presidency after his father’s assassination in 2001, has shown every intention of attempting to stay in power. Opposition to “third termism” has been spreading in Africa. It began with the October 2014 popular uprising in Burkina Faso, which ousted President Blaise Compaore following his attempts to remove the two-term limit added to the constitution in 2000, and extend his 27 years in office. Burundi was next, with President Pierre Nkurunziza’s announcement that he would run for a third term triggering months of opposition protests and violent clashes this year. Unlike Burkina Faso, Burundi’s embattled president survived, winning controversial reelection in July amidst opposition boycott. Since then, political violence and the targeted killing of opposition activists has continued, with at least 134 reported dead since April 25. Meanwhile, in the Republic of the Congo, opposition leaders boycotted a referendum on October 25 to remove constitutional term and age limits that would prevent President Denis Sassou Nguesso from seeking a third consecutive term in that country’s 2016 elections. Five days earlier, police used tear gas and fired on anti-referendum protesters in Brazzaville and Pointe Noire. Government sources claim four people were killed in the clashes, while opposition leaders place the number at over 20. The threat of further violence looms, particular after the official results, expected to be strongly in Nguesso’s favor, are announced. The DRC is likely to be the next battleground. While Kabila has refrained from attempting to amend the constitution directly, politically motivated delays to the electoral calendar could result in the postponement of the presidential elections slated for next year. This glissement (French for “slippage”) of the electoral timetable would allow Kabila to prolong his stay in power without resorting to the kind of constitutional revisions that triggered the downfall of Burkina Faso’s Compaore. 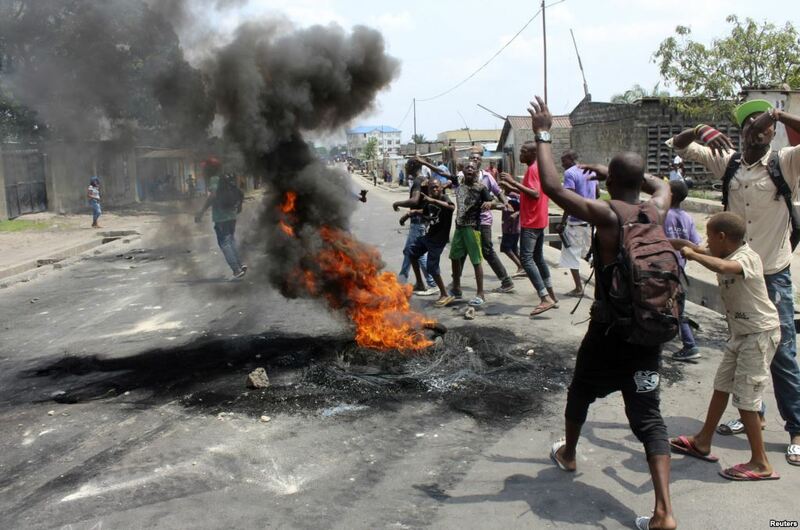 Protests against Kabila’s rule first erupted in Kinshasa this past January, with opposition parties, civil society groups, and students leading three days of large-scale unruly action. Kabila responded with the deployment of riot police and presidential guards and about 40 protesters were estimated to have died. The rally was called to reject a controversial electoral census requirement, which would have allegedly taken years to conduct, thereby delaying the 2016 polls. Since then, the country’s security forces have been quick to quell dissent, dispersing and arresting anti-government demonstrators, including temporarily detaining Senegalese and Burkinabe activists and a US diplomat at a pro-democracy rally on March 15, as well as forcibly dispersing anti-Kabila rallies in Kinshasa and Mbuji Mayi on April 24. After months of relative calm, Kinshasa recently witnessed the renewal of anti-Kabila protests on September 15. Organizers from an opposition coalition of 20 political parties called the demonstration to denounce a series of delays to the current electoral calendar, which requires that local, communal, provincial, and gubernatorial elections all take place prior to the November 2016 presidential elections. Police used tear gas and live fire to disperse the rally, after armed youth had attacked the hitherto peaceful event. Rights groups have claimed the youth were paid by senior security forces and ruling party officials to stir up unrest. Meeting the electoral timetable has become an increasingly unrealistic endeavor, as the necessary legal, logistical, and financial measures are not yet in place. For example, the gubernatorial elections for 16 newly created provinces slated for August 31 were postponed by the electoral commission for an indefinite period due to the failure of provincial assemblies to adopt the necessary political and legal measures. Moreover, Western donors have expressed criticism of the election preparations thus far and remain reluctant to provide financial backing to the government.In the context of rising anti-Kabila sentiment, the announcement of further delays to the electoral timeline will continue to trigger similar backlash. However, the opposition and civil society-led movement lacks a leader capable of uniting the fragmented groups and seriously challenging the Kabila camp. Enter Moise Katumbi. The popular, wealthy and politically savvy governor of the mineral-rich Katanga Province resigned from the ruling People’s Party for Reconstruction and Democracy on September 30, denouncing Kabila’s attempts to defy the constitution and delay elections. Two weeks prior, Kabila dismissed the leaders of seven political parties from the ruling coalition, after they had called on him to respect the constitution and leave at the end of his second term. While no official ties have been made between Katumbi and the so-called “G-7” leaders, the timing of the two events and common interests suggest that they were likely coordinated in advance. Katumbi was a long-time Kabila supporter and both men hail from the province of Katanga. He is the president of the successful and widely supported Tout Puissant Mazembe football club, and is respected by Katangans and their political elites as a competent leader. Whether he can translate his success in politics and business to the national stage and bridge the historical divides between the Swahili-speaking Katangans in the east and the mostly Lingala-speakers in the west remains to be seen. However, his candidacy would pose the most robust threat yet to the Kabila camp, particularly if he can attract the support of the G-7 leaders and opposition parties. The DRC has an estimated 24 trillion USD in mineral wealth and yet was ranked 186 out of 187 countries in the UN’s 2014 Human Development Index. For a country mired in corruption, economic stagnation and continued violence by armed groups in its restive eastern provinces, Katumbi’s presidential ambitions could provide a glimmer of political hope. However, one thing is certain, as the threats of popular protests and electoral challengers grow, Kabila will attempt to extinguish them and maintain his grip on power, signaling more political violence and upheaval ahead. This entry was posted in International Justice by Alex Fielding. Bookmark the permalink.